Woke, showered and walked Mix. Breakfasted and set off with Rachel and Mum for Gavinton Church where we joined in the morning service which this week was on the theme of Jacob’s marriages to the daughters of Laban: Leah and Rachel. After Church we joined the congregation for coffee and then returned to Mount Pleasant for Sunday lunch. I spent the afternoon with Mix, partly in the summer house and partly sitting in a deck chair enjoying the sunshine – relaxing while following England’s progress against India (not very much progress), Rory McIlroy’s progress to victory in the Open Golf (well done) and Durham’s progress against Sri Lanka (a dismal defeat). 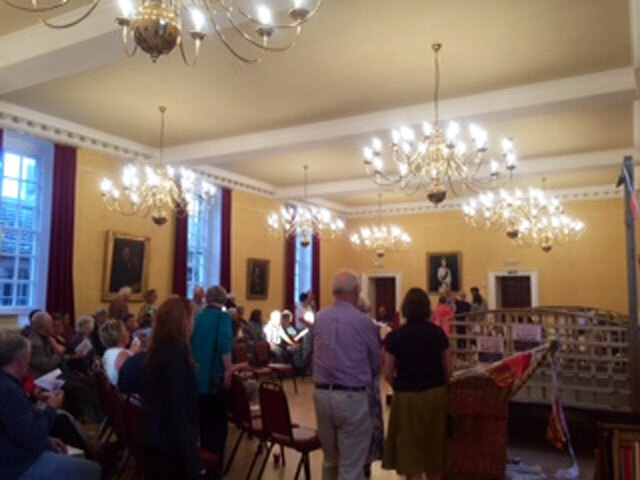 Rachel and I went off to Berwick to attend a presentation of The Pirates of Penzance by Gilbert and Sullivan as part of the Berwick Festival of Opera. It was a small cast performing in front of a fairly small audience of around sixty, I suppose. The performers were all professional singers and, as one would expect, the singing was superb. If one wanted to be picky, much of the acting left something to be desired. I suspect that the performance had not really been directed and the cast members were fairly ill-disciplined. I will long remember Ruth begging Frederick to marry her while wearing a huge wedding ring (and purple finger nails); some of the ladies failed to realise that if they were going to sing about taking off their shoes and stockings, it would be better not to come onto the stage in bare feet; and at least two of the (male) cast members had their words written on their hands. Costumes and props left a bit to be desired but, as always, the music of G & S won through and everyone had a really grand evening in splendid surroundings. The small orchestra was really good. On the way back to the car we passed a Chinese take-away so I enjoyed a shrimp curry with chips as Rachel drove me home – next time I will not choose a curry, not because it was not excellent but because I ended up with much of it down my shirt. Ah, well. Back home, Mix took me for a walk before bed.